Michael Singer Studio was selected as a part of an integrated design team to lead the re-imagining and design of the new West Palm Beach Downtown Waterfront. The Waterfront is over a 1/2 mile long and encompasses over 12.5 acres along the Intracoastal Waterway. 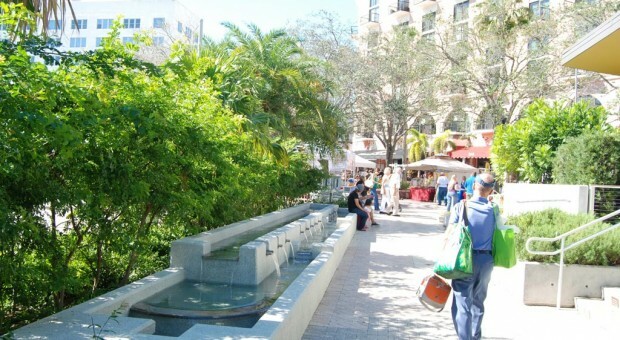 The new civic space revitalizes the City’s historic downtown and restores the natural beauty of West Palm Beach’s waterfront. The Studio designed the main commons and event spaces, 3 new floating docks, shaded gardens, two community buildings, a continuous waterfront esplanade, shade trellises, custom benches, 7 water elements and an estuarine ecological regeneration area known as the South Cove. Shaded garden pathways along both North and South Clematis Streets have several unique sculptural water gardens. Along North Clematis are three distinct water garden spaces. Heading west to east, the first is a fragrant garden with a multilevel linear water element inviting visitors to continue deeper into the gardens and toward the waterfront. The second garden is a lush tropical garden that encloses a small outdoor room with dense vegetation and the sound of flowing water. The third garden is a sonic garden designed with the sound of rushing water and the rattling of pockets of bamboo to distract visitors from the noises of the nearby roadway. In the middle of the site a crescent water element wraps the center platform and event space at the east end of Clematis Street. This multi-level water element cascades from the north and south meeting at a low point to the east, towards the waterfront. This water element and several others have become notable local play spaces for children. Along South Clematis there is an aquatic garden with water lilies and native aquatic plants and another cascading water element along a ramp leading to the upper terrace of the Waterfront Pavilion. At the waterfront north landing there is a singular curved water element along the back of a long bench that rains down water within a confined channel. This element too was created to distract from the sound of the adjacent roadway. All of the gardens recycle their water and were designed with a small footprint to minimize evaporative water loss. The in-water lights change colors and are energy efficient LED fixtures. For more information on the West Palm Beach Waterfront Project click here.